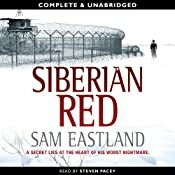 The third book, Siberian Red (released as Archive 17 in the US), from Sam Eastland’s gripping new series of detective novels set at the birth of Stalin’s Russia is released on audio today. Steven Pacey continues his brilliant narration of the series. More about the other two audiobooks.